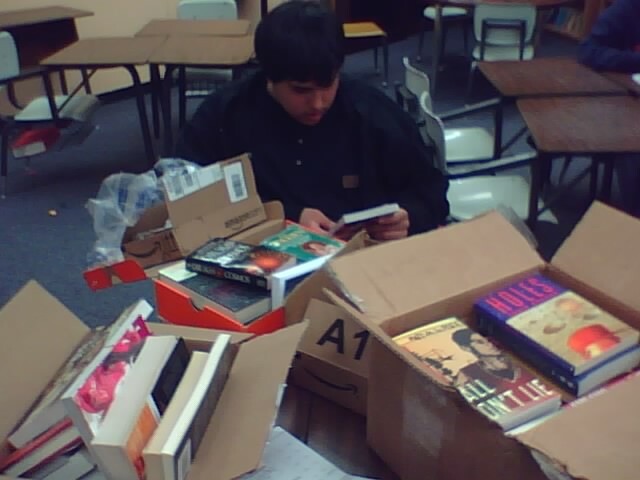 Via Wick Sloane ’76, here is an update on EphBlog’s efforts to send books to Noah Smith-Drelich ’07, in his second year with Teach for America on the Pine Ridge Reservation in South Dakota. 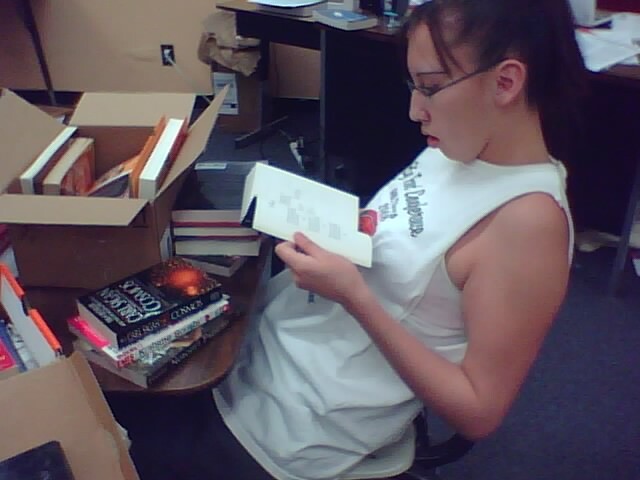 We have gotten box after box of books from generous Ephs (and parents/friends of Ephs). I have to say, this is quite the impressive display of the Williams alumni network; in total I would estimate that we have received over 200 books, many of them ordered new from Amazon! That said, my favorite part of this whole process so far has been watching my students go through the boxes. 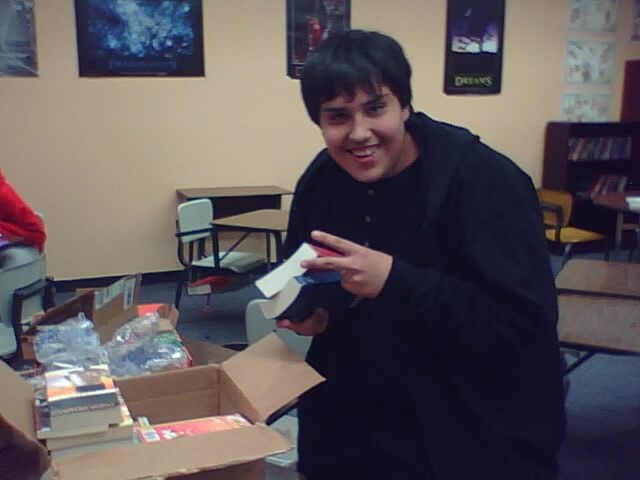 We had almost a week straight where I was getting one or more box every day, and my students started coming into class early to go through the books before class! I’ve gotten so many Sherman Alexie books that I now am able to devote an entire shelf to Sherman Alexie alone. I also now have a shelf entirely of other Native American authors, as well as a shelf entirely of Native American books by non-Native authors (before, all of my books by or about Native Americans fit on to one shelf). In fact, I am in the exciting position of needing another bookshelf for my library–six just isn’t cutting it anymore. If you know of someone who donated books and did not receive a thank you card from me, please let me know. As Wick notes, “200 is a great start. Let’s go for 2,000.” See here for Noah’s address. More pictures below the break. Thanks to Wick (and Dave) for the update. This is so wonderful. I agree…let’s go for more. Noah could even post a specific wish list that could be checked off in the comments section. A list or some other form of co-ordination would be most useful– at least for those of us with lesser clue about what to send. What about Mexican Indians, published in English? Anyone? Sorry if that was “cryptic”– I’m afraid I may be equally cryptic in trying to clarify. As far the books and what Noah is doing– well maybe I should be writing Noah– I hope the overlaps, the great narrative of human events and the interconnections– are a little clearer– even if I feel I’ve just “stolen” another thread. I will check with Noah to get more specific information here. Thanks to you all. 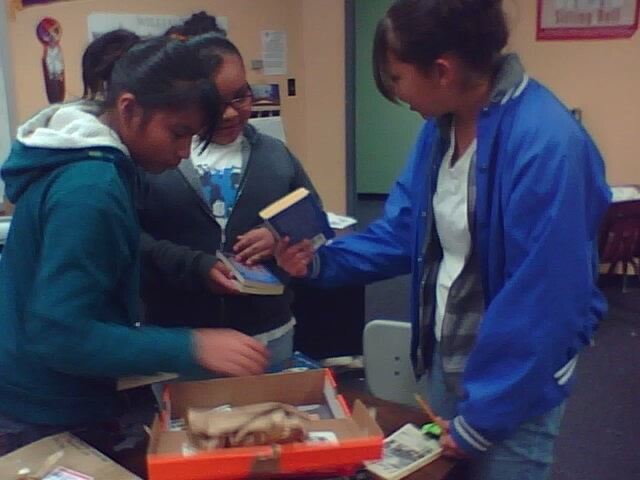 Photos of young students opening boxes of books, and smiling. What could make for a better day? When I was in my local library yesterday, I noticed that they were selling donated books in good condition for $.25 to $1 each (and offered a volume discount). That struck me as a great way to help two institutions at once. Can Noah use old National Geographics (for reading, geography, art projects, or whatever)? I saw some on a back shelf at the library sale. 1.) I’ve sent a note to Noah and asked him to post some specific needs. 2.) A student of mine at Bunker Hill Community College, John Around Him, grew up on the Pine Ridge Reservation, where Noah is. John is now at Dartmouth and he has begun collecting books there to send to Noah, too. EphBlog is powered by WordPress and delivered to you in 0.779 seconds using 41 queries..